Baywood is located South of Edmonton, Alberta just off Highway # 2. Both the dogs and I enjoy our surroundings. The property is fully fenced and surrounded by mature trees. Baywood dogs thoroughly enjoy the mischief they find in the large paddock off the yard and in summer can be found playing in kiddie pools set out for their enjoyment. Summer 2004 also brought the completion of an Agility Field. My love and involvement in purebred dogs has been a life long passion. When not at work with my dogs, you will find me at play or on vacation with them. As matter of fact, holidays taken have always been horse or dog related. After breeding and showing German Shepherds for a number of years, my daughter was diagnosed as allergic to dog hair. I had became concerned with the trend the GSD breed was taking and in my search for a new non-shedding companion, came across the beautiful Portuguese Water Dog. 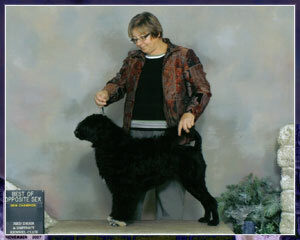 After much research, investigation, and endless phone calls I choose to purchase a dog from Jane Harding of Cutwater Portuguese Water Dogs in Darien, CT. AM/CAN CH. Cutwater's Fancy Free CD, (Tibbett) became the first step for what is Baywood's Portuguese Water Dogs today. 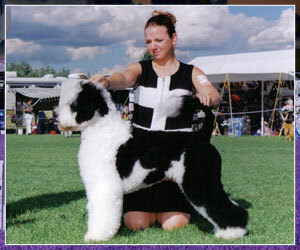 When "Tibbett" arrived in 1989 the Portuguese Water Dog was not yet recognized with the Canadian Kennel Club. "Tibbett" was shown by professional handlers Butch McDonald and Shauna Bernardin, in many CKC Miscellaneous breed classes to promote the breed. In 1990 the PWD finally became recognized. "Tibbett" became a great ambassador for the breed in Alberta. 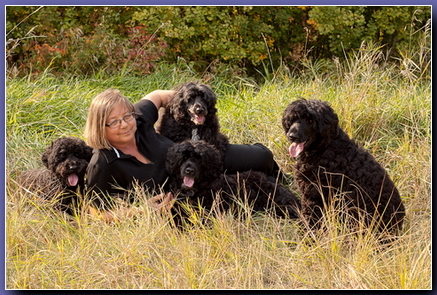 Continuing my breed involvement, I have served as President of the Portuguese Water Dog Club of Canada (PWDCC) and Secretary of the Alberta Portuguese Water Dog (APWDC) and am currently a Director of the Alberta Portuguese Water Dog Club and agility representative. I am also a member of the Portuguese Water Dog Club of America. In addition to my full time day job which pays the bills, I teach agility and puppy obedience classes for both the OC Agility Club in Edmonton and Four Paws Grooming in Wetaskiwin Alberta. On any given weekend I can be found with my mini-van full of dogs competing at confirmation shows, agility, rally or water trials. I attend most Canadian and US Nationals to compete and to see where the breed is going. One of my proudest moments is when I traveled to Washington with a borrowed wet suit and only my land trained dog, Can Ch Armada's Santa Maria, CD. Since I don't swim, Hanna and I amazed all present when Hanna passed her Apprentice Water Dog certificate. A well-trained dog is a joy! My daughter's involvement with our dogs started out when, as most other kids were hanging at the mall or going to Disney Land, Kathy was hanging out in the grooming shop or going to a dog show! As matter of fact she whelped out her first litter in Junior High. Kathy became a successful Junior Handler with our Tibbett under the wonderful guidance of friends and mentors, Butch McDonald and Cec Ringstrom. Kathy has always been our number one handler taking pride in showing the dogs we have bred. Handling and grooming our PWD's has given her the opportunity from to travel from one side of North America to the other. Unfortunately, growing up and moving away is inevitable with children and Kathy now works as an Equine Sports Therapist (www.equisportstherapy.com) and resides 3 hrs away in Calgary, Alberta. She is still very involved in our breeding, showing and socializing of our dogs.